About The Stadium You have a lot to live up to when you simply call your ground The Stadium. Unfortunately it doesn’t. The ground does look a bit tired these days, with the car park looking like a building site. Inside the ground has two stands – the main stand has a few rows of seats and has a bar behind, with the entrance and exit via the old tunnel. The view is obstructed by pillars and also sits bizarrely some 5 metres behind the touchline, whilst either side of it the perimeter fence sits on the touchline. On the opposite side is a small stand again sat back from the touchline. Around the rest of the stadium is simple standing behind the barrier. How to get to The Stadium If you are coming by car you will almost always approach via the M25. From the all directions exit the motorway off junction 25 and then head north on the A10. At the next roundabout turn right onto the A121 Winston Churchill Way. At next roundabout turn left into the High Street. Pass under the railway bridge and take the next left into Theobalds Lane. The ground is 200 yards down this road on the right hand side. NOTE: On the way out you can continue down Theobalds Lane and turn left onto the dual carriageway, then straight over the roundabout for the M25. The nearest railway station is Theobalds Grove. Turn left out of station, and left into the High Street. Pass under bridge and then left into Theobalds Lane. It is about a 5 minute walk. Waltham Cross station is about 15 minutes away – Out of station, turn left onto Eleanor Way, over the roundabout into Monarchs Way and then over the next roundabout into High Street, then as above. Admission to The Stadium Admission this season for adults is £7, concessions is £3.50 and children under 16 is just £1. Programmes are available on the gate for £2. 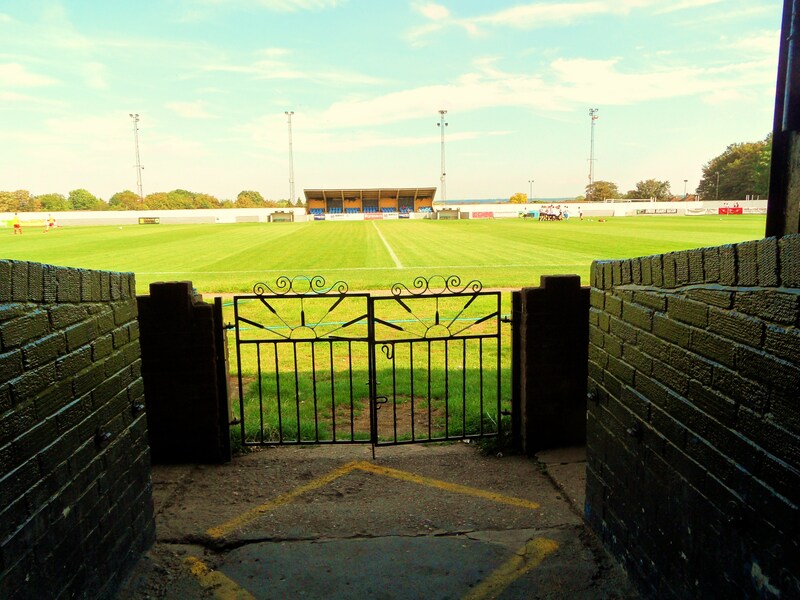 Our last visit – August 2011 A trip to Cheshunt in Hertfordshire for an FA Cup game should have given me plenty of scope to think up a headline or two but I struggled for hours as to what I should call this. Could it be Sweet Amber, the classic song by Metallica; or perhaps bAmber Gascoigne, in homage to the original University Challenge quizmaster, or even Every little helps as a nod to Cheshunt’s most famous resident Tesco. But let’s just think sensibly about this. It is Non League Day. A day of celebrating everything good about our grass roots game, and reminding all of those fans who are used to being told where and when to sit down, what you can and cannot chant and above all expecting to pay significant sums of money to keep a badge kissing footballer in his mansion for another season. And to me, one of the key elements of Non League Football is a beer. Let’s face it there is nothing finer than enjoying a pint whilst you are watching a game of football. We do it at home, we can do it in the pub, but the fun police say we cannot when watching “professional” football. So what better way to celebrate NLD than to raise a glass to the combined brains of Mike Bayly and James Doe for giving us the second Non League Day. But of course those pesky fun police said “NO”. Well at least at a significant number of Non League grounds. You see it was FA Cup Preliminary Round day, and that means a new set of rules apply. Sorry, I missed out a word there, it was The FA Cup, Sponsored by BUDWEISER, preliminary Round day. A beer sponsoring our national competition yet the licensing laws had to change. Madness. I was just going to have to grin an bear it. I was off to Cheshunt versus Southend Manor. Ryman League North versus Essex Senior League in front of 150 fans. If I had chosen to be at Wealdstone just down the road I could have lined the pints up around the edge of the pitch without an issue as that was a league game and would be played out in front of three times as many. But the FA know best and the Southend Manor crew were obviously a major worry for them and alcohol. This was our first venture into the FA Cup this season, and as you would expect our options for a game were numerous. The Lewes Lunatic Fringe were heading off to deepest, darkest Hampshire for Badshot Lea v Chertsey Town, with the winner hosting Lewes in the next round. 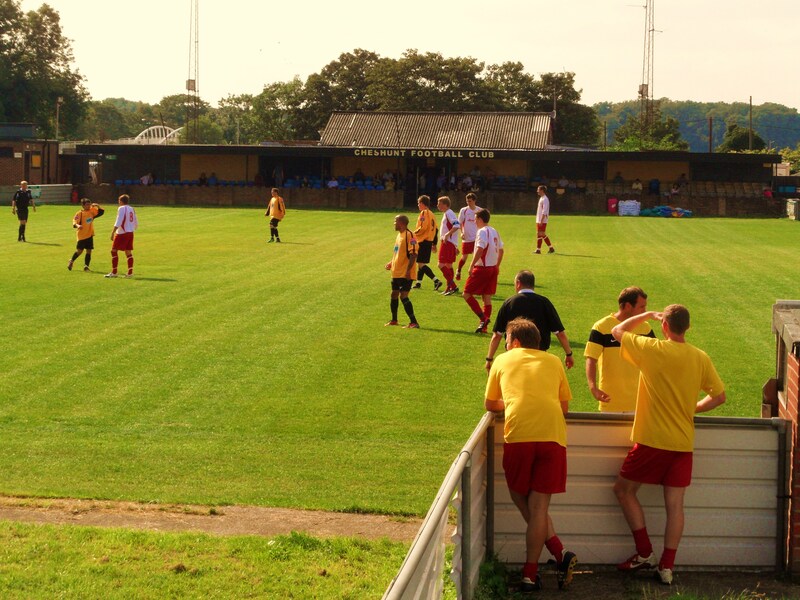 Then there was the emotional step back in time to Corinthian (Note – NOT Corinthian Casuals) versus Maidstone United at Gay Dawn Farm, a lovely little ground surrounded by the Kent countryside where I grew up playing football. But on a day where I was to rack up my 27th game of the season so far I needed to put some family time in. A few weeks ago CMF and I had enjoyed our little jaunt down the White Water Rafting course at Lee Valley and thought it would make a good day out for the Little Fullers, and so I agreed to take them up there. So my “sphere of influence” was set to within 15 minutes of Waltham Cross. One fixture jumped out. Cheshunt versus Southend Manor. Not because of the glamour of Cheshunt Stadium, nor the fact that Cliff Richard grew up in the town, but because I could walk to the ground from our Fuller Family Festivities. Oh, and Iain Dowie, a man only equalled in the “faces for radio” competition by Jimmy Bullard, played for the club for a while. If it is good enough for him, then it is good enough for me..that sounds a bit Dodgy (Ed – groan). 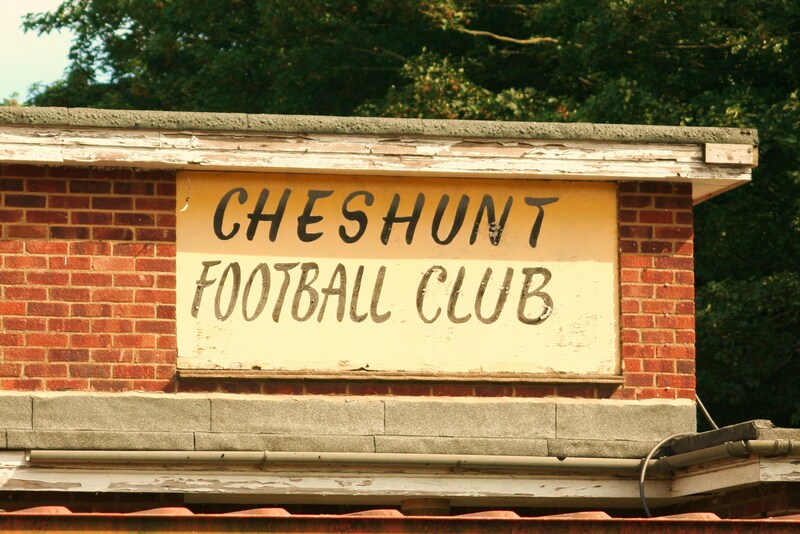 Cheshunt FC are something of a fixture in the Ryman League. They have bounced up down and around through various restructures, hitting the dizzy heights of the Premier League in 2004. Today they sit in the Northern half of the second tier of Isthmian League football, enjoying the local derbies against the likes of Ware, Waltham Abbey and Potters Bar Town, albeit with moderate success, finishing last season in 18th spot. Visitors Southend Manor were formed back in 1955 by Doris Metcalf. Well, Doris and Gil who I assume was her husband Gilbert. After doing their stints in the Southend Leagues they made it into the Essex Senior League in 1985, and actually won the league in the days before automatic promotion up the pyramid in 1991. Last season they gained a respectable 5th place finish, and whilst they have aspirations to be playing at the Cheshunt level one day. So FA Cup Preliminary Round here we come. The prize for the winner? A cool £1,500 and a home tie against Romford or Royston Town. But as we were going to be “dry” for the next two hours we needed some liquid refreshment. On arriving at the ground we saw no special offers for Non League Day, no reduced admission for Premier League and Championship fans despite passing half a dozen Spurs shirted youths walking away from the ground. I did see a small poster in the club bar, but it was hardly getting into the spirit was it. 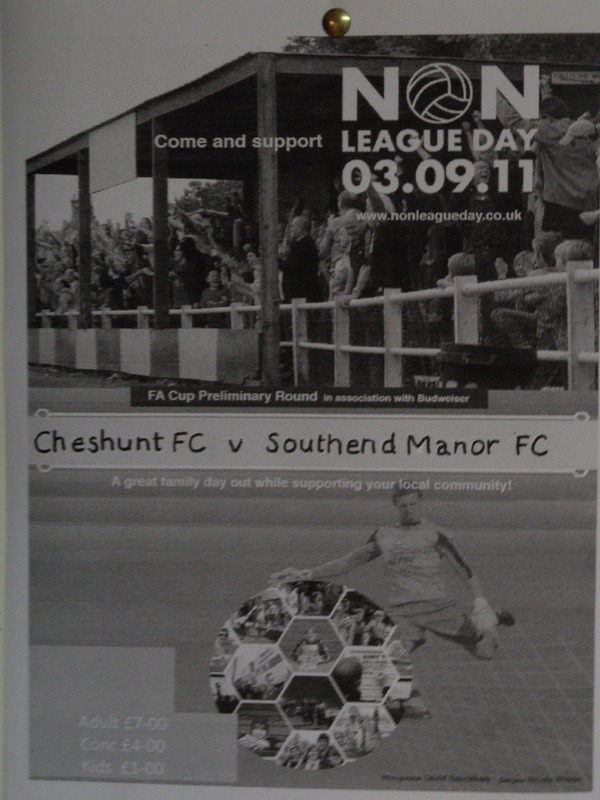 Cheshunt 0 Southend Manor 0 – The Stadium – Saturday 3rd September 2011 Cheshunt play at The Stadium. It is a bold claim to use the singular for their ground. It has seen better days. I am not sure that it had a car park, or whether it was some kind of builders yard. Caravans in one corner, portaloos in another and right in the middle a big pile of stones. I will use the word “worn”. The actual playing area was one of the strangest I have seen as well. On the halfway line on either side, the fences bent inwards by 5 metres to create a sort of picnic area. You have to see it to understand what I am saying, but it was very strange. However, it is a great feeling to walk out of the bar through a tunnel on the halfway line. I will whisper this quietly, but it wasn’t a very good game. Both teams seemed to struggle with the heat, a sentence that we haven’t had to use in 2011 in England. But actually when you think about it, these teams were only separated in theory by six places, with the visitors arriving in Hertfordshire on top of the Essex Senior League. The two teams had actually met before in this round of the cup back in August 2008 when Cheshunt ran out 2-1 winners. Cheshunt weren’t at full strength with skipper Matt Turpin and Charlie Moxon suspended, keeper Williamson still out injured and Josh Hutchinson and Glen Parry both missing. And why were Mesers Hutchinson and Parry missing? The former was at a wedding, the latter still on holiday with the lads in Shagaluf. You can’t beat Non League football can you? Well, what can I tell you about a nil nil draw where neither keeper really had a save to make? Well, at one point Cheshunt nearly ran out of balls and a drastic search on the roof of the main stand ensued when they were down to one. 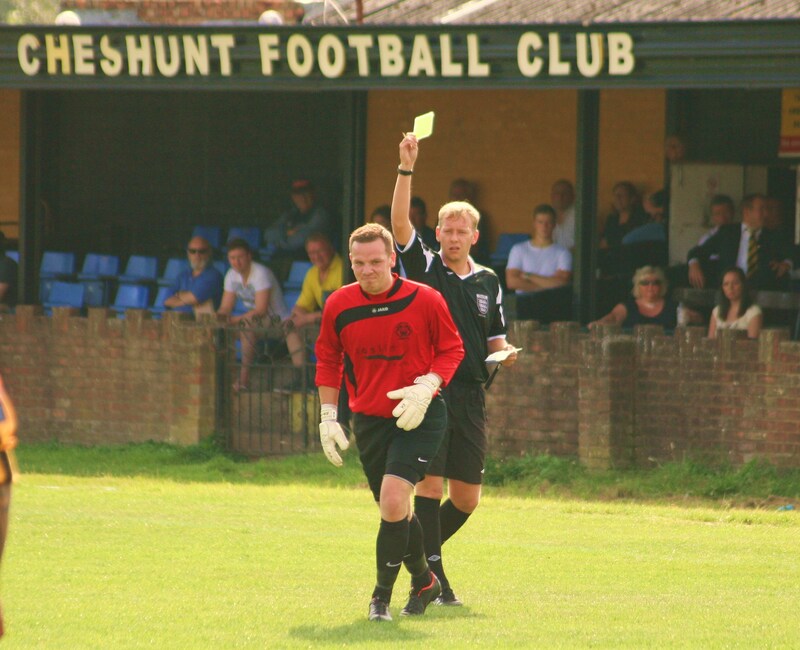 The away keeper, Adam Seal, can be thankful that the referee didn’t show a red card for a rash challenge outside the box in the first half, and Southend Manor can also be thankful that the linesman wasn’t able to keep up with play, twice flagging for non-existent offenses that would have seen Cheshunt players clean through on goal. So a draw was probably the fairest result in the end on the last day of summer. Cheshunt’s best ever run in the FA Cup had come in 1977 when they reached the 4th Qualifying round but I think it will take the return of their party players to get anywhere close to that this year. The attendance looked quite a way down on their previous league game against local rivals Ware (197) which will be a disappointment, but I have to say that perhaps the club could have done more to get some of the locals involved in Non League Day. The sun shone all afternoon and despite both teams struggling to put themselves into the next round For more snaps from the world’s oldest cup competition click here.